After having built something similar with 3DGS, now here’s my take on it with DXStudio by Worldweaver. 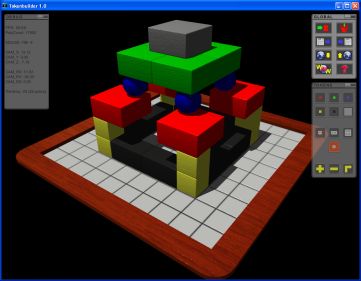 Again, this is a test application to learn the use of this game engine. The ‘game’ simulates playing with wooden tokens of different shapes. A few types and colors can be selected and positioned on a grid. Fixed resolution for Tokenbuilder Redux is 1024×768. It will run in windowed mode only. MS Windows only (tested on XP). Download the file below (it comes with the dxstudio player installation files, too). Start the game by unpacking and double-clicking the downloaded exe file. This is another test application, done with DXStudio. This time, focusing on using the network and physics capabilities. The program will connect to this server and place you in a rather large (yet boring) game world. You can see other players walking around (if any online) and send messages via the basic chat message. 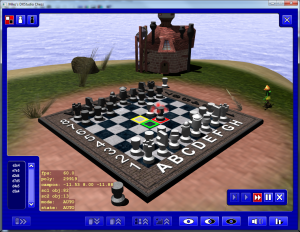 The landscape is dynamically created and updated, depending on the player’s position. 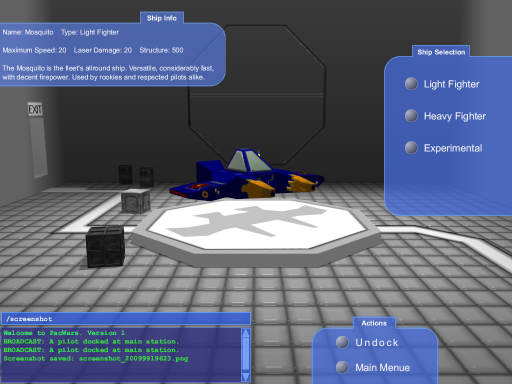 All objects have physics and dynamic shadowing switched to on. Fixed resolution for myMMOG is 1024×768. It will run in windowed mode only. MS Windows only (tested on XP). This time, I’m testing how DXStudio is doing when embedded as an ActiveX control. The hosting application is a VS C++ .net MFC dialog. To make things even worse, I skipped the DXStudio built-in network functions and used Enet, a light-weight network layer for both, linux and windows. 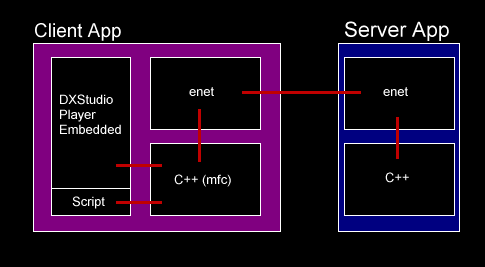 This gives us the possibility to create a native server application on a linux machine. The Enet source code (to compile a lib on Windows or Linux) is not included in the files below. It can be downloaded at their website: http://enet.bespin.org. My compiled *.lib and *.a is, though. – The server app will check for clients and periodically send new object positions. It does handle connect/disconnect events aswell. Please note that you might need to update the file location of the DXStudio player and the server IP/port in the client’s code. 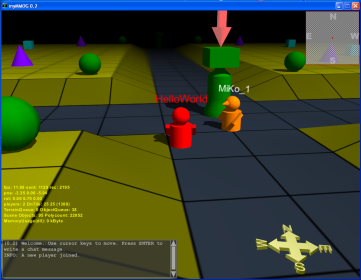 dxs_MMOG.zip 3/5/2009 10.5 MB Including VC C++ .net project, dxstudio document, server c-code, makefile, compiled enet libs. 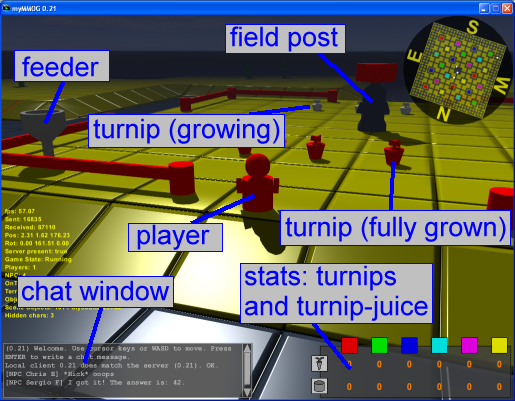 This multiplayer test game is about growing turnips of different colors. Upon login, you can select one out of 6 colors for your avatar (the “faction color”) and type in a name. There is no persistent login accounting, so choose whatever you want. Then, your task is to farm turnips for your faction. This would not work without the help of other factions, so you’d better help them, too! The game plane consists of several fields, where one can grow turnips. Each such field is surrounded by a fence, and only turnips of one color can grow there. In the middle of each turnip field, you can see the “field post”. By clicking on the post, new turnips can be seeded. They need to grow before harvesting, though! To grow your turnips, some turnip juice of another color than your own is needed. As you can only handle turnips (and juice) of your very own color, you rely on the help of other factions (colored players, that is). They need to click on the “feeder” on your field, and spend some of their juice. As you should do at their growing fields! Click on a fully grown turnip (one that has your color) to harvest. Then walk over to the “Juice-o-mat” in the center of the game plane and process it to juice. You can see the current game’s stock at the lower right-hand screen. Don’t forget to seed new turnips by clicking on the “field post”. Only turnips that have been seeded before will grow when juice is spent! The game has been written with DXStudio (both, client and server application). Microsoft Windows only. The server application was running on a Windows 2003 vServer, rented at United Hoster. Actually, it was the smallest one available there (1000 CPU units, 320MB RAM), so things might get choppy when many users should be online. Please note that the game server is not online anymore. turnipmaster10.exe.zip 3/25/2009 15.7 MB Turnipmaster 0.21, including the DXStudio player. Debug output is on. This is my submission to the DXStudio Summer 2009 Demo Contest, running 18 June 2009 to 17 Sept 2009. It actually won a prize back then. 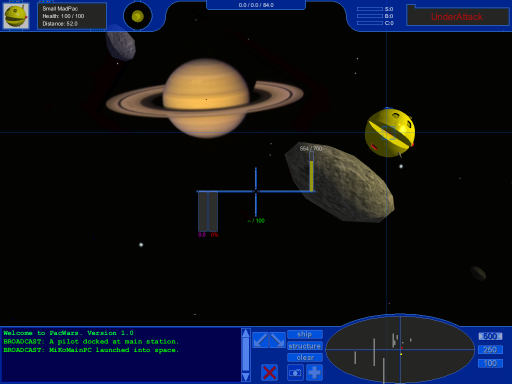 It is a multiplayer 3D spaceflight simulation demo, featuring good old pac-man as enemy AI. 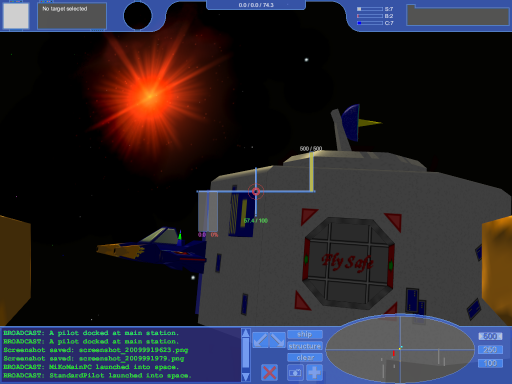 And is is kind of a tribute to the MMO space game Jumpgate by Netdevil, which I used to play for quite a long time. Multiplayer ability is being realized without a dedicated server application, just using a message dispatcher on a remote server for data transfer between the clients. BY DESIGN: As network message processing is linked to the clients’ framerate, weak clients (having very low fps) could bog down communication. BY DESIGN: On program startup, the 3D scene(s) are already running in background (to ensure quick availability when launching). So, even when showing the main menu only, fps need some time to recover after startup. This is notable especially when running the program and immediately switching to the “Intro” topic. For those who want to have a headstart with a video (rather than reading through the ingame manual). There is an ingame video with comments, recorded with the free version of AVS Video Editor 4 (showing a watermark in the beginning). See Downloads below. Download and unzip the file below. Preferably, store it to a separate folder, as some temporary files are created at runtime. Start by double-clicking the extracted *.exe. If not already present on your machine, the DXStudio player will be installed automatically then, too. To run, PacWars needs an internet connection, as the program contacts the “multiplayer data dispatcher” (aka DXStudioServer.exe) on demo.dxstudio.com. There is no “pure offline” operation mode. 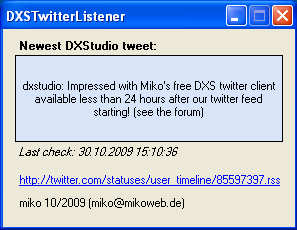 DXSTwitterListener is a C#/CLR application that polls the rss feed of DXStudio on Twitter, and shows a popup whenever a new ‘tweet’ has come in. I made it to follow this particular channel on my PC without the need to log in or receive something on my cell phone etc. It is not of use anymore. The rss feed to poll is hard coded. It will be retrieved every two minutes. If it has changed, a popup showing the latest ‘tweet’ is shown in the upper left screen area. The popup can be closed again by clicking on it. When minimized, the app hides in the system tray. Double-click there (or right-click for a menu) to restore it again. The app comes with an installer, all created with VS 2008 C# Express. A pure fun program, not really of use anymore. 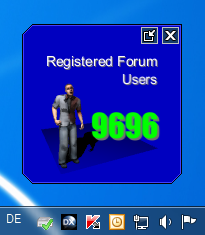 It does periodically poll the DXStudio website for the number of registered forum users. Then shows that number in a ‘faked’ gadget-like desktop window (calling it ‘faked’, because it is a normal app that hides in the taskbar and has a window, looking like a gadget. Therefore, it should run on XP aswell). 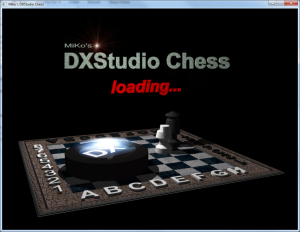 This is a managed C++ app with the DXStudio player embedded. 101114_DXSForumMemberCount_Source.zip 11/15/10 7.5 MB DXSForumCount Source. Visual C++ 2008 Source (CLR). A 3D game of chess. 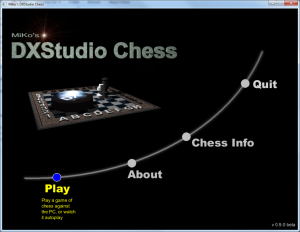 DXStudio Chess uses one of my DXStudio Plugins. This plugin is under the GPL, while the DXStudio application provided below is freeware – with no source publicly available, though.